Ever wanted to know where the money raised by the lottery goes? You’ve come to the right place. When you play the lottery, you aren’t just getting a chance to win big, you’re helping students and schools across the state. Over $670 million in money raised by the lottery supported education programs in all of North Carolina’s 100 counties last year. That’s the 2017-18 school year. While these funds represent only a portion of the state’s overall education budget, the money we raise makes a difference – just see for yourself. Being ready to learn helps kids get the most out of school. The N.C. Pre-K program serves four-year-old children who are at risk of falling behind their peers as they prepare for kindergarten. Thanks to lottery funds, 13,965 children across the state received a free, academic pre-school experience last year. Students need space to learn. School systems use money raised by the lottery to help build and repair schools. Last year, local school districts received a total of $100 million in lottery funds for school construction and repair. This helps meet needs that otherwise would have to be paid for by alternative means, such as property taxes. Local officials decide the best use of the construction funds they receive. Money raised by the lottery helps make dreams of college become reality. Money raised by the lottery provide scholarships based on financial need to help students cover the costs of attending a state university or community college in North Carolina. Last year, 25,927 students received a lottery scholarship. A second way that the lottery helps make college affordable is through the UNC Need-Based Grant Program. Last year, 50,157 students received grants to attend a state university. It takes a team to make a school work. Last year, more than $380 million in lottery funds were made available to support the operations of public and charter schools, including the costs of support staff such as office assistants, custodians and substitute teachers. Beginning last year, legislators increased funding for school construction by adopting a new needs-based grant program. This new program, funded exclusively by lottery dollars, helps small, rural counties with critical building needs to build new schools. Last year, $30 million of money raised by the lottery helped four counties meet their school construction and repair needs. Just like students need a place to learn, they also need a safe way to get to school. Money raised by the lottery helps cover costs for school-provided transportation, like bus drivers’ salaries, fuel, and other related costs. Last year, counties received over $43 million to help cover the cost of school transportation. Local officials decide the best use of the funds the county receives. Ever wanted to know exactly how lottery funds make a difference where you live? Choose your county from the drop-down menu or click on your county on the map to find out. 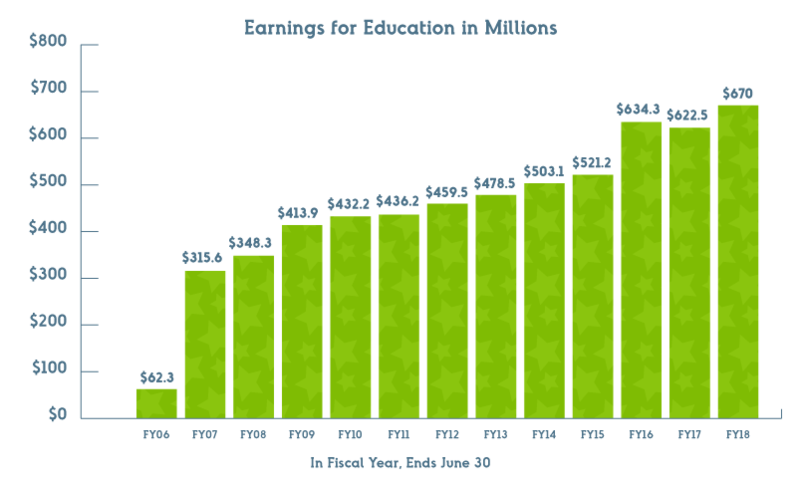 Thanks to steady growth in sales, education programs have received more than $6.24 billion* since 2006. This chart shows how much money was raised for education each year. Money raised by the lottery has made a difference in North Carolina every year since 2006. Over time, lottery funds have been directed by legislators to support different education programs, including paying for the salaries of teachers and teacher assistants and digital learning initiatives. While there might be different opinions on the best use of money raised by the lottery, that does not mean the way it is used today isn’t doing a lot of good. Each year in the state budget, the legislature can adjust which programs receive funds raised by the lottery. This is an overview of how the assignment formula has changed over time. 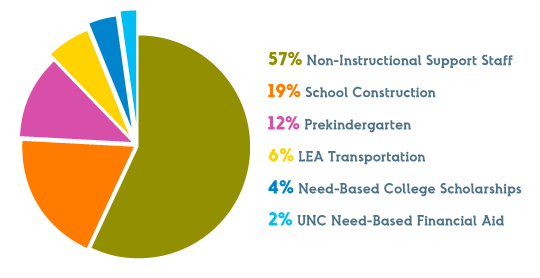 The Fiscal Research Division of the N.C. General Assembly provides an annual report summarizing lottery fund distribution to education programs in every county. The lottery uses the report to produce beneficiary brochures and to update county information on our website. Operating efficiently and effectively helps the lottery raise more money for education. Last year less than 1% of revenue was spent on salaries and benefits. And since inception, the lottery has used, on average, about half of what it's allowed for administrative costs.